Recognizing whether you are a disadvantaged applicant is self determined; submission of disadvantaged status paper does not provide you leverage in passing your application but offers you more space in explaining your story. Disadvantaged status essays offer an opportunity for students to demonstrate their individual differences in terms of financial capacity or if you are considered to belong to the minority. When writing a disadvantage status essay, be sure to share relevant, interesting and honest story about your experience and condition. Remember that admission committee on top academic institutions utilizes your socio-economically disadvantaged essay in order to evaluate your personality, skills and scholastic potentials. Getting a space in any dental medical school having a disadvantaged status or as a disadvantaged student might not be as easy as it sounds. One reason is due to the great number of students equally applying through this means. To fully convince the application committee that you have a disadvantaged status depends on how convincing you can appear. To achieve your goal, it is expedient that you narrate relevant, honest and a life experience that is interesting enough to relate your condition. Your disadvantaged status essay is an opportunity to state your financial capacity or your minority status. It shows your financial difficulty in years gone by either as a result of the divorce of parents, death of a parent, growing up in war-prone areas, the list is endless. Aside from the economic status, an obstacle in the social area (this has to do with ethnicity, religion and language issues) of one’s life is also an angle to consider. Educational disadvantage (difficulty in getting an education or attending substandard public schools) is also a reason to apply for the disadvantaged status. There are several things that must be taken into serious regard when writing your disadvantaged status paper. It can be easy to neglect important factors which could compromise the effectiveness and success of your paper. Your socio-economically disadvantaged essay must offer a clear and concise preview of your experiences that enables to reflect your values, dedication and genuine interest towards attaining academic success. In any disadvantage status paper, it is important to focus on positive lessons instead of languishing in failures and mistakes. Use this is a chance for you to demonstrate your ability to rise above and continue despite constant struggles. In writing your disadvantaged status essay, you would be required to provide any information that shows your background as being a socio-economically disadvantaged student. This is necessary because it would be used by the admission committee to evaluate your personality, skills and general potentials. Giving a brief description of your childhood growing environment is also a catch on how qualified you are as a disadvantaged applicant. State a clear and precise view of your experiences and ensure it reflects you in totality; your values, interest, and dedication. State the positive lessons learned and how it has sharpened you into a better person. Show that you have developed the ability to rise above seeming challenges and constant struggle. State categorically the area of a disadvantage you experienced; social, education or economical. Accurately answer all the questions in the ‘childhood information” section. Don’t ignore questions that have to with family income level, public assistance, having experienced teachers, your support of the family and so on. Not knowing how to go about writing a disadvantaged status essay should not result in frustration. Contact us for professional help, because we are the expert when it comes to writing socio-economically disadvantaged essays; essays that have to do with educational disadvantage. 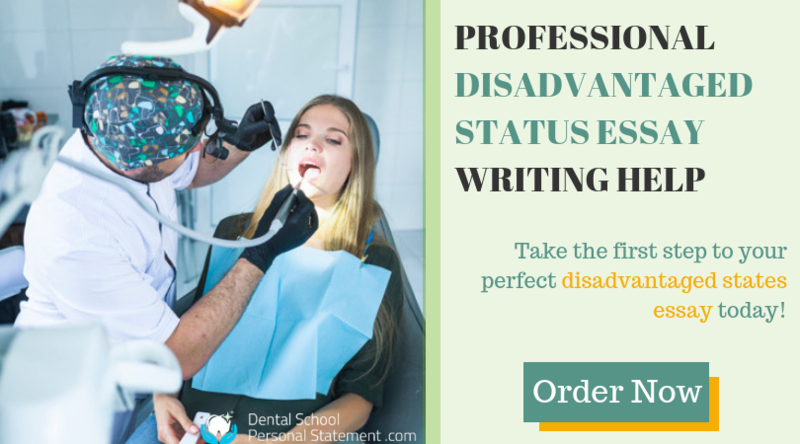 Let’s make this a pleasant experience for you all the way by turning your disadvantage to an advantage in dental medical schools admission. And you did be glad to have sought our help. 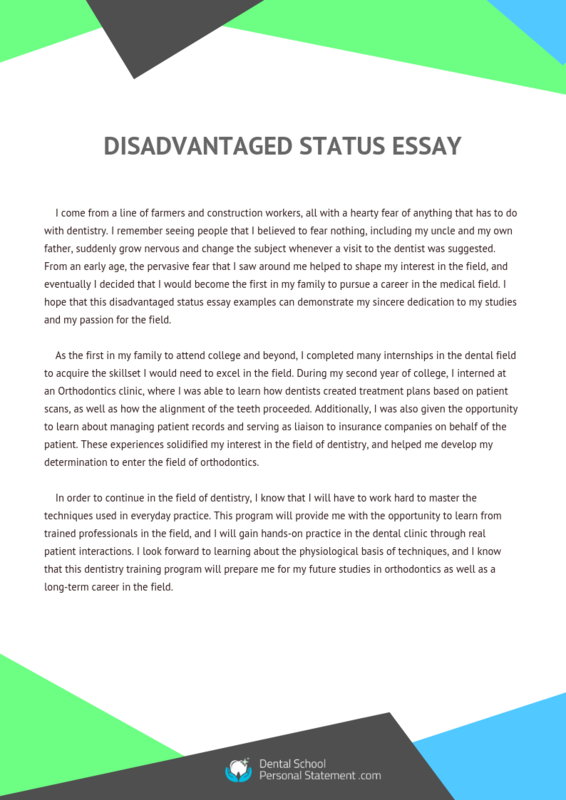 We do disadvantaged status essay right, presenting your experiences as though we were there with you every step of the way. 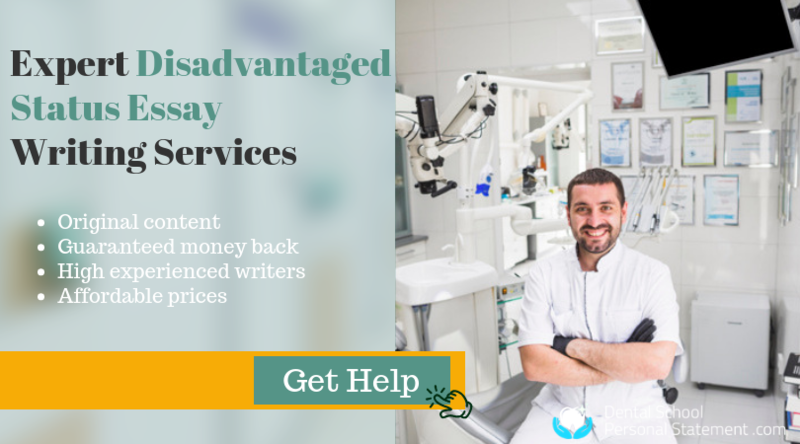 Our team of experts will help guarantee the success of your admission into a dental medical institution of your dream through your socio-economically disadvantaged essay. So let’s take the stress off you with our error-free, plagiarism-free, and original disadvantaged status essay content. You are sure to get that admission without any form of hassle. Contact us today for a chance to get you admitted into your medical program with ease. Writing a disadvantage status paper can be a challenge to most students especially that this determines whether or not they qualify and be admitted to top schools. Fortunately, you can now easily get help from our professional academic writers. Disadvantaged status paper does not have to be a stressful task but with the assistance from our team of experts, we can make this an enjoyable experience. Ensure the success of your application by submission of error free, non-plagiarized and top notch socio-economically disadvantaged essay. Get our help with writing your disadvantaged status essay today!